Used test: Audi Q3 vs Honda CR-V vs Mazda CX-5 vs Toyota RAV4 | What Car? The Honda CR-V and Mazda CX-5 have classic, high-set SUV driving positions. You sit a lot lower in the Audi Q3, so it feels more like a conventional hatchback. Only the Toyota RAV4 offers the driver both options, thanks to its greater range of seat-height adjustment. The RAV4 also has plenty of steering wheel adjustment, as do the CR-V and CX-5, whereas some people will wish the Q3’s wheel dropped lower than it does. However, it’s actually the RAV4 that’s least comfortable on a long journey, because its seats don’t offer enough lower-back support and lumbar adjustment isn’t even an option on the model tested. The CR-V and CX-5 are far more impressive here, giving you lumbar adjustment as standard, while the Q3 has more-supportive seats than the RAV4. Adjustable lumbar was an option on the Q3, however, so if you suffer from back problems, you’ll need to check to see if it’s been specified on the examples you’re test-driving. Interior space is the RAV4’s strongest area. In fact, it’s absolutely cavernous. It has more front space than any of its rivals in this test, even though none of them leave the driver feeling cramped. What’s more, there’s loads of rear headroom in the RAV4, along with class-leading rear legroom. A six-footer will be pretty comfortable behind a similar sized driver in the CR-V and CX-5, too, but things are much tighter in the back of the Q3; it offers barely any more space than a small family hatchback, such as the Volkswagen Golf. To make matters worse, the Q3 has a pronounced transmission tunnel that forces any central rear-seat passenger to sit with their legs apart, whereas its rivals all have flat rear floors, and their extra shoulder room makes it easier for three people to sit side by side. What’s more, the CR-V, CX-5 and RAV4 also have taller and broader rear door openings than the Q3, which anyone with children to fit into child seats will appreciate. Although the manufacturers’ claimed capacity figures show that the CR-V has the biggest boot, the RAV4’s is just as usable in the real world, thanks to its extra width and a huge storage area beneath the boot floor. The downside is that you don’t get a spare wheel, although Toyota is planning to offer one as an option later. The CX-5 isn’t left trailing on space, either, but you may struggle to fit all of the family’s clobber in the boot of the Q3. Fold the rear seats, and the RAV4 has a clear advantage, with a load space that stretches to nearly two metres – around 20cm farther than the next longest, which is the CX-5. As a bonus, the RAV4 has an impressively low load height, which should prove just as valuable as its plethora of cubbies and storage solutions. The only things that let down the RAV4 are its frustratingly slow electric tailgate and the lack of an easy-fold rear bench. Where the CR-V and CX-5 have levers in the boot that will fold the spring-loaded rear seats flat with a single tug, the Toyota’s must be folded from the side door, and it’s a much clunkier action. 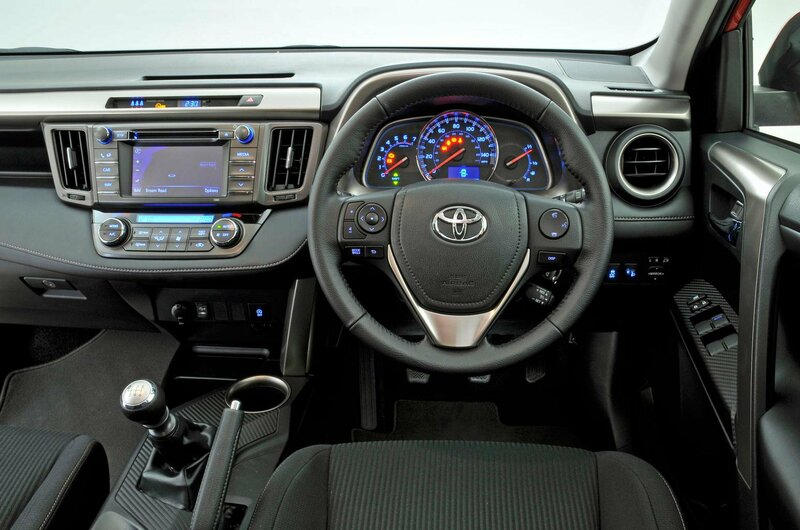 Despite man-made leather on some of the dashboard, the RAV4’s interior is pretty underwhelming. Drab plastics dominate and the fake carbon fibre around the gearstick has a whiff of tack about it, although everything feels solidly built. At the other end of the perceived quality scale is the Q3. All of the materials in its cabin look and feel expensive, plus most of the controls are beautifully damped and there’s a real sense of understated style and solidity. The CR-V and CX-5, meanwhile, sit between the other two cars. In each, there’s a decent smattering of high-grade materials, but old-school graphics on their touch-screens and switchgear combine with some shiny plastics to cheapen the overall appearance. 17-inch alloy wheels, climate control and four electric windows were fitted as standard across the board here, while all but the CR-V have automatic headlights, rain-sensing wipers and front foglights. Both the Q3 and CX-5 get rear parking sensors, too, but only the Mazda has sensors at the front of the car. Front and rear sensors cost extra on the RAV4, although you will get a reversing camera as standard to help you back into tighter parking spaces. Disappointingly, parking aids weren’t even available as an option on the entry-level CR-V that we’re testing here. Meanwhile, the Audi is the only car in this test that didn’t come with standard cruise control, although it was an optional extra, so if it’s a must-have for you, you’ll need to check to see if it’s fitted. 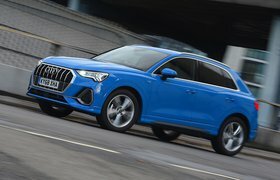 Each of these cars suffers from a big rear blindspot, despite having chunky door mirrors, while the Q3’s raked-back windscreen pillars give it the worst forward visibility of the four. By contrast, the forward view in the RAV4 is excellent because its pillars are slim and pushed out to the edges of the car.